The 2019 Honda Civic is one of the most respected and coveted models on the market. It has arrived to the new market year with a phenomenal range of features, both standard and available, offering luxury, safety, and comfort no matter where you take it. The 2019 model has received updates to offer a more sophisticated interior experience, and if you would like to learn more, continue reading below! What are the engine options available with the Civic Sedan? The exceptional Civic Sedan is offered with an incredible lineup of engine and power options. The standard engine on the LX and Sport trims is a 2.0-liter four-cylinder engine with 158 horsepower and 138 pound-feet of torque. It comes standard with a six-speed manual transmission but offered with an optional Continuously Variable Transmission. The EX, EX-L, and Touring trims are equipped with the phenomenal turbocharged 1.5-liter four-cylinder engine which boasts 174 horsepower and 162 pounds-feet of torque. The turbocharged engine is paired with the Continuously Variable Transmission. The Touring trim also gains paddle shifters for a completely engaging ride. Can you tell me more about the design and standard features in the Civic Sedan? The excellent 2019 Honda Civic is available in a great selection of trims and features. The Civic Sedan in particular is offered in the following trims: LX, Sport, EX, EX-L, and Touring. Each trim is loaded with a stunning range of standard features. The sedan's base trim is called the Civic LX, and it features highlights like 16-inch steel wheels, LED running lights, a 5-inch central display screen, a four-speaker sound system, Bluetooth, and a USB port. The Sport trim boasts a center-outlet dual exhaust, Apple CarPlay and Android Auto integration, an eight-speaker audio system with dual USB ports, and a 7-inch touchscreen interface with HondaLink. The great EX trim not only receives the turbocharged engine, but it adds a sunroof, heated front seats, dual-zone automatic climate control, satellite radio, and 17-inch alloy wheels. The luxurious EX-L trim features leather upholstery and an auto-dimming rearview mirror. The Touring is similarly equipped to the EX-L, but it adds an integrated navigation system, a 10-speaker audio system, heated rear seats, and 18-inch wheels. Is the Civic Sedan a safe vehicle? 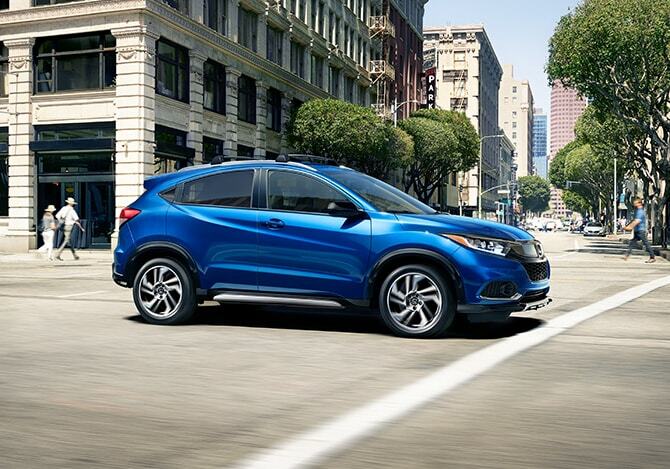 Honda has long been the top choice for customers who want a safe and secure vehicle. Every Civic Sedan has innovative safety systems, many of which come standard. The Civic LX boasts adaptive cruise control, rearview camera, automatic high beams, forward collision warning with automatic emergency braking, road departure mitigation, as well as lane departure warning and keeping assist. The Sport trim upgrades the rearview camera to include dynamic guidelines, while the EX also gains Honda's LaneWatch blind-spot camera. If you are searching for a new sedan that offers a reliable, exciting, and sophisticated experience, there is no better choice than the 2019 Honda Civic Sedan. Versatile and modern, the Civic Sedan is beautifully designed and offers an energetic performance. Contact us today to learn more about the new 2019 Honda Civic!